A photo, which recently surfaced on the Internet, appears to show the meeting of a mysterious cult in Washington, D.C. 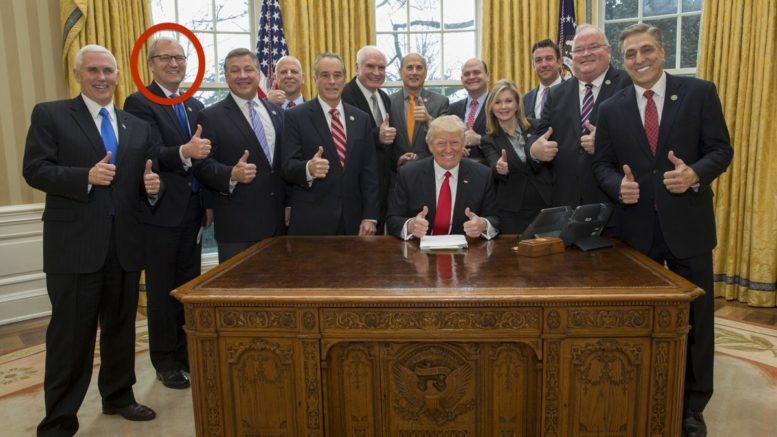 It seems the cult requires its all-white members to point their thumb fingers upward, while the rest of the hand closes into a fist. A close examination of the photo reveals that U.S. Rep Kevin Cramer (R-N.D.) joined in the ritual. We can only assume that the man in the middle is the cult leader and, using witchcraft, has placed the others under his spell. Check back later for updates on this developing story. 4 Comments on "Congressman Cramer Photographed at Cult Ceremony"
Now there is a rarity. The ability to capture a photo of that many idiot assclowns together in one place at one time. You know that most of the guys in that pic are mad that that one woman made the picture, ruining their “Only White Males Allowed” club. Congrats Kevin Cramer you are full fledged member in the thumbs up our asses Putin’s puppet club. A bigger collection of assholes have never been in the same room at one time. Sad, very sad for North Dakota! He is a disgrace!